I read this book a while ago now, but kept putting it on the back burner until I had time to write about it, since it was not one that had to go back to the library. I also didn’t quite know what to say about it. There is a lot going on in this book, so I could go into it in great detail, but I am going to try to keep it simple. What I liked best about this book was what I learned from it. So, that is what I will focus on. There is also a long sweeping story full of characters, some of which I grew impatient with as I was reading. Some of the characters seemed too perfect, and some of the storylines a little too coincidental. That’s not to say that it wasn’t a good story, and the section of the book that dealt with the destruction of Guernica was very well done. But, for me, I wanted more history, less love and forgiveness. 1. Boling talks about the Basques people and their culture with love and compassion. He puts so much into the creation of his characters that it is all the more devastating when they are under attack. 2. In 1936, the Spanish Civil War began. The Nationalist Rebels, led by Franco, wanted control of the country, and there was widespread hardship and countless atrocities. To make things worse, the Nationalists were getting support from Nazi Germany. “Franco’s troops are bloodthirsty for Basques, and the Germans are unpredictable. For Franco, there is more to this. Every one of us he can be rid of now will be one fewer to worry about when he’s running Spain. 3. On April 27, 1937, the city of Guernica was bombed for more than three hours straight, destroying the city and hundreds of the people living there. As they gained distance from Guernica, Xabier could see the red-amber glow of the burning town, and in his priest’s mind, he wondered if the night sky was filling with smoke from the raging fires or from the ascending souls of the needlessly dead. [Von Richthofen] had never expended more resources toward the destruction of a single target, and the town of Guernica had been leveled without a Condor casualty. 4. Four thousand orphans were evacuated to England. In his book, Boling elaborates on the life of the orphans once they get to England, and adds yet more characters to continue telling the story of the aftermath of the bombing of Guernica. 5. After the fall of Bilbao, Franco declares that speaking the Basques language is now illegal. He also condemns any Basque priests for having ignored “the voice of the the church”. 6. Jose Antonio Aguirre, the Basque president, flees the country under fire, and will never return. 7. During the German occupation of France in WWII, many Basques risked their lives helping to smuggle goods and soldiers from France into Spain. One of Boling’s storylines involves this activity. The Spanish Civil War was one of the world’s great tragedies, with savageries on all sides and a casualty total that may never be known. I tried not to tax the reader with elaborations on the complex and volatile politics at work at the time… but rather to establish a general context of the poverty, oppression, instability, and disenfranchisement that common citizens would have felt. There are many faces to any tragedy, and this was told from the perspective of the Basques, who were famously staunch in the defense of their land. Historians have disputed the death toll from the bombing of Guernica, but the act nonetheless remains at the taproot of the assaults against civilian populations that the world still grieves on an all too regular basis. 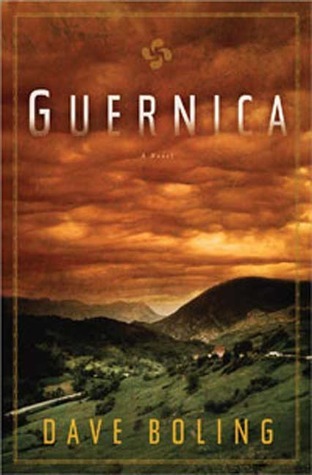 This is a good book to read if you are interested in learning more about the Spanish Civil War, the Basques people and their part in the war, or about events and politics taking place leading up to, or at the same time as, WWII events. It is also a good book to read if you enjoy family sagas involving many characters and more than one generation. The story alternates between a few of the more central characters, giving different viewpoints of the events that take place. Dave Boling also has a new book out called The Undesirables, set against the backdrop of the Second Boer War. I’ve been considering reading this book for a while now, mostly because I find Picasso’s painting so haunting. But like you, I would want more history than love and forgiveness. This book might stay on the backburner for a little while longer. It was a good story, but, yes, if you are looking for something with a little more history of Picasso and his famous painting, you might want to read a different book. Picasso’s War by Russell Martin looks interesting, but I have not read it. Also, if you want to read more about the actual painting, this one looks good: The Genesis of a Painting: Picasso’s Guernica by Rudolf Arnheim. I have heard about this book from you and from someone else. I guess I should check it out. I think it is worth checking out for anyone who likes a little history with their stories! Ah, history ratio low, is it? There is a fair amount of history, but it is very heavy on the story, too. Hmm, I’m not exactly a history buff but I’m always open to learning more. I wonder if this would be a good start since it seems to be story-heavy enough to ease me in? If you like a story with a lot of characters, over several generations, centered around one main love story, and seen from many different viewpoints, then you will probably like it. I liked it, but I was hoping for a little more history and a little less story. And, you will learn a bit about the Spanish Civil War and the bombing of Guernica in the meantime. Also, be prepared for some tears, but ultimately, the story is hopeful. I had this book in my Nook for a long time before I finally got around to reading it. I am glad I did read it finally. The story is okay, the history lesson is great. I agree. Thanks for commenting! I’ve had this book for years but still haven’t read it. I think the history is what intrigues me most about it. Glad you learned a lot from it. The historical aspect was the best part for me, too. I’m glad that I read it. Thanks for commenting! I love your Picasso quote to the German. It’s been a while since I have read this book but I thoroughly enjoyed it and its insight into the Basque culture. I only know of two other books that reveal more of the Basque culture. Obabakoak by Bernardo Atxaga and The Basque History of the World. I especially loved Bernardo Atxaga’s novel. I love that quote, too! Another good suggestion, and this one I have never heard of. Looks interesting!